Linda Edna Cardellini (born June 25, 1975) is an American actress. She is known for playing Lindsay Weir on Freaks and Geeks (1999–2000), Samantha Taggart on ER (2003–09), and Meg Rayburn on Bloodline (2015–17). She received an Emmy Award nomination for her portrayal of Sylvia Rosen on Mad Men (2013–15). Cardellini is also known for her portrayals of Velma Dinkley in the live-action Scooby-Doo! film series (2002–04), Cassie in Brokeback Mountain (2005), Laura Barton in Avengers: Age of Ultron (2015) and Avengers: Endgame (2019), and Dolores in Green Book (2018). She received an Independent Spirit nomination for her performance in the film Return (2011). Cardellini's voice work includes the animated television series Scooby-Doo! Mystery Incorporated (2010-2013), Regular Show (2012–15), Gravity Falls (2012–16), and Sanjay and Craig (2013–16). Cardellini was born in Redwood City, California, the daughter of Lorraine (née Hernan), a homemaker, and Wayne David Cardellini, a businessman. She is the youngest of four children. Cardellini is of Italian, Irish, German, and Scottish descent. She was raised Catholic. She made her first public appearance at age 10, when she sang in a school play. Subsequently, she acted in several school productions and started attending drama lessons. She graduated from nearby Mountain View's Catholic St. Francis High School in 1993, then moved to Los Angeles to seek roles in television and film. 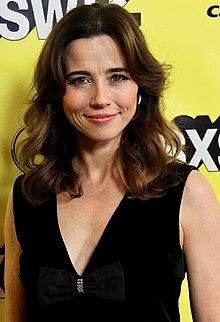 In August 2018, Cardellini was cast to co-star with Christina Applegate in Netflix's dark comedy series Dead to Me. Applegate, Will Ferrell, Adam McKay, and Jessica Elbaum will be credited as executive producers of the series. ^ a b Jacqueline Cutler (November 25, 2007). "Linda Cardellini". Chicago Tribune. Retrieved August 26, 2018. ^ a b "Knockout Nerd". People. July 1, 2002. Retrieved March 1, 2019. ^ Schneider, Steve. "Opening in Orlando: High Life, Penguins and more". Orlando Weekly. ^ Watkins, Gwynne (June 12, 2013). "The Mad Men GQ+A: Linda Cardellini on Sylvia Rosen's Extramarital Bombshell: The Q". GQ. Retrieved October 31, 2013. ^ a b c Petrozzello, Donna (August 19, 1999). "Young Actress Takes Shine To Playing A Movie Starlet". New York Daily News. ^ a b Linda Cardellini. AskMen.com. ^ "Linda Cardellini Made Her First Television Appearance As A Contestant On 'The Price Is Right' (VIDEO)". ^ MacIntyre, April (April 9, 2009). "TV Land Awards gives Icon award to 'ER'". Monsters and Critics. Archived from the original on August 13, 2010. ^ Gotham Awards Nominations Announced Archived September 22, 2012, at the Wayback Machine. FilmMakerMagazine.com, October 25, 2005. ^ "12th Annual Screen Actors Guild Awards and Nominees". Screen Actors Guild. 2006. ^ Stransky, Tanner (August 17, 2007). "Where are the 'Freaks and Geeks' now?". Entertainment Weekly. ^ "Angels & Prophets: Linda Cardellini". drgodcomedy.com. Archived from the original on May 22, 2011. ^ "Performers 2011 Line Up : Linda Cardellini". SFSketchFest.com. Archived from the original on July 16, 2011. ^ "Freaks and Geeks / Undeclared Reunion". PaleyCenter.org. March 12, 2011. Retrieved March 16, 2011. ^ "Freaks and Geeks Still Rocks". IGN. March 14, 2011. Retrieved March 16, 2011. ^ "About the Show and the Segments Within – Sparks Nevada, Marshal on Mars". The Thrilling Adventure Hour. Archived from the original on December 7, 2013. Retrieved October 31, 2013. ^ Campos, Nicole (June 8, 2010). "Martians and Superheroes and Nazis, Oh My! : 'Adventure Hour' Thrills Sell-Out Largo Crowd". Public Spectacle art blog (We Recommend). LA Weekly. Retrieved October 31, 2013. ^ "Norbert Leo Butz Joins Netflix's Drama Series From 'Damages' Creators Todd A. Kessler, Glenn Kessler & Daniel Zelman". TVWise. Retrieved September 19, 2015. ^ Prudom, Laura. "'Bloodline' Ending After Season 3 on Netflix". Retrieved September 14, 2016. ^ Andreeva, Nellie. "Linda Cardellini To Star In Netflix Dark Comedy Series 'Dead To Me'". Deadline Hollywood. Retrieved August 3, 2018. ^ Wright, Megh. "Christina Applegate to Star in Will Ferrell–Produced Netflix Comedy Dead to Me". Vulture. Retrieved July 16, 2018. ^ "LA Leaders, LMU Distinguished Alumni Reception 2007" Archived January 8, 2013, at the Wayback Machine. Loyola Marymount University. February 22, 2007. Retrieved January 2, 2013. ^ "Distinguished Alumni Awardees 1970–present" Archived January 8, 2013, at the Wayback Machine. Loyola Marymount University. Retrieved January 2, 2013. ^ "This breakup really broke up Jason Segel". Los Angeles Times. April 13, 2008. Retrieved June 7, 2013. ^ "Linda Cardellini Expecting First Child". People. June 22, 2011. Retrieved March 1, 2019. ^ "Linda Cardellini Welcomes Daughter Lilah-Rose". People. March 6, 2012. Retrieved March 1, 2019. ^ "Linda Cardellini Engaged: 'Freaks And Geeks' Actress And Boyfriend Steven Rodriguez Set To Wed". The Huffington Post. June 7, 2013. Retrieved June 7, 2013. ^ "SEARCHLAB/Shorts: Certainly Not A Fairy Tale". Fox Searchlight SearchLab. January 4, 2007. Archived from the original on October 25, 2010.